18a. [He played one of the lead roles in the film version of 50-/55-Across], JOHNNY DEPP. Along with Benicio Del Toro, if memory serves. 23a. [Writing style popularized by 35-Across], GONZO JOURNALISM. 35a. [Author of 50-/55-Across], HUNTER S. THOMPSON. I once met a young woman whose summer jobs during college entailed working for Thompson in Aspen, as his assistant. I reckon she has stories. 50a/55a. 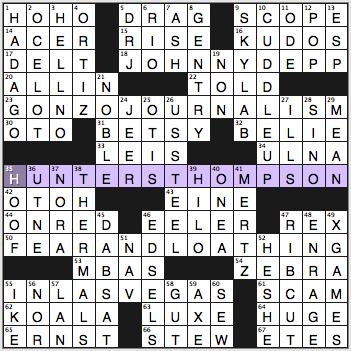 [See 35-Across], FEAR AND LOATHING / IN LAS VEGAS. No room in the theme for the classic Thompson illustrator, Ralph Steadman. But five answers taking up 65 squares is sizable. You might expect some compromises in the fill based on the thematic density, and you’d find it in bits like OTO, ONE-A, SINO-, and EELER, but not at all with “HELL NO,” CUDDLE UP, and X-GAMES. Mostly the fill is ordinary fare not racing away from the newer solver. 1a. [Treat similar to a Yodel], HO HO. I’ve never seen a package of Yodels in my life. They were an East Coast thing. Did they come back to life like zombie Ho Hos did? 6d. [1982 double-platinum Duran Duran album], RIO. For a time, that was absolutely my favorite album. 12d. [Punch in the face, informally], POP. Violent. I needed the crossings to get this one. 26d. [Company that built the Unisphere for the 1964-65 New York World’s Fair], US STEEL. Trivia I did not know, but I always appreciate learning the odd trivia bit for future trivia competitions. That recent puzzle in which I learned that Oliver Stone had written Scarface? Came in handy in Learned League about a week later! 47d. [Barbecue beef choice], RIB CUT. Is that a thing, RIB CUT? Haven’t seen the phrase before. 51d. [Maritime org. ], NAV. Really? A 3-letter abbreviation of a 4-letter word? Isn’t this abbreviation more often standing in for an adjective, naval? Maybe? One dictionary tells me it’s short of net asset value or for navigation/navigator (my car’s GPS system has a button labeled NAV), and gives no mention of the navy. Okay. 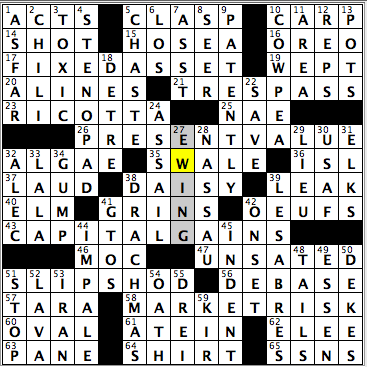 A lot to like in today’s puzzle: strong theme and theme execution, some excellent non-theme fill and clues, a nice amount of internal glue, too. At first blush, this is not an “easy” theme—but the gift of wordplay is at work—and once you’ve cracked that, the real fun begins. It’s all about parsing well-known, lively two-word phrases (top-notch in their own right) into kinda wacky, not entirely improbable three-word phrases, each of which begins with a state postal abbreviation (the “place” of title). Results for me were highly smile-making. 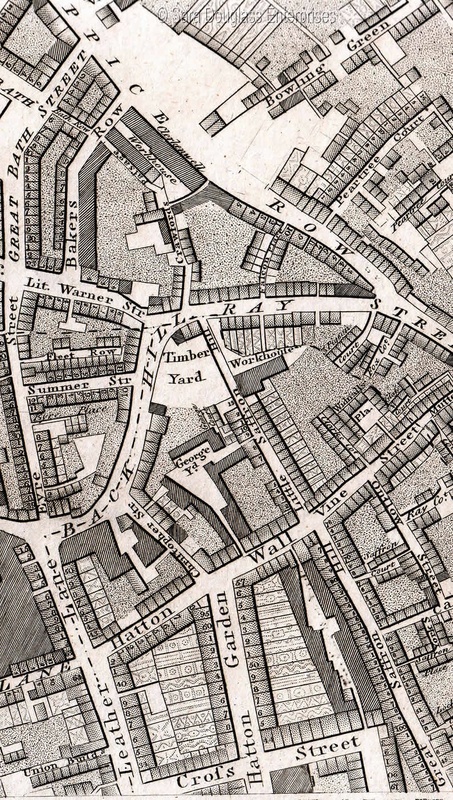 17A. [Takeover of lingerie fabric in the Keystone State?] Keystone State? Pennsylvania, abbreviated PA. Lingerie fabric? LACE. Takeover? COUP. Put ’em all together, you get PA LACE COUP. Put that all together for the base phrase and, “Hello, palace coup.” This is a great way to get started. Get it? I’ll spell out one more, then yer on yer own! 27A. [Cabinet member in charge of blockades in the Bay State?] Bay State = Massachusetts = MA. Type of blockade = DAM. Cabinet member = SECRETARY. Yield = MA DAM SECRETARY, from Madam Secretary (not only a term of address, but now also a well-received tv show). 58A. [Angry rockers that perform in the Peach State?] GA RAGE BAND. Garage band. I think this is my fave and feel like Liz saved the best for last, making this a great way (imoo…) to close out the theme set. Of the remaining non-theme fill, the stand-outs include the non-seasonal but always welcome CANDY APPLE (make mine caramel, please!) and, truly, the now almost too-poignant ARAB SPRING. All that promise—and only four years ago. This isn’t a political forum, but I dearly hope a turn towards a lasting peace is possible by four years hence… METRICS and ACADEME and especially “OO-LA-LA!” light up my life. Also, cluing NICOLAS Cage by way of his voice-over work as Grug in The Croods—an animated film I didn’t expect to enjoy but found myself taking real pleasure in. Other clues that added to solving pleasure? For starters, there’s the non-art-world-related [Cubists?] for the quotidian DICERS. A peppy clue goes a long way to perking up more standard fill and is always welcome! [Not so hot?] is the non-judgmental approach to the temperature-related WARM. And I got a kick out of [Derby derrière] for BUM. So we’re not lookin’ at the Kentucky kinda Derby here, but the Derby (or “Darby”…) in England—and in that part of the world, bum is another word for one’s keister. As for the internal glue I mentioned, we get a couple good examples. Our friend the candy apple is clued as [Halloween treat on a stick]. That word “stick” also appears right from the start at 1A. [Stick that’s twirled], for BATON. And a baton is often required equipment for a drum majorette. Emulate her (or the drum major…) and we’ll see you STRUT your stuff! Then, note how INSIST [Put one’s foot down] crosses “I SAID ‘NO’!” [Repeated refusal]. In my scenario that refusal was offered in response to a to an oft-repeated (possibly whiny) “CAN I?” [“Please, Dad?]. Sorry, kid. Not today. The pair that was a complete mystery to me was AT-AT and [Bot in “The Empire Strikes Back”]. (As far as I know…) this fella has never had as much play as Artoo Detoo or See-Threepio, but as an All Terrain Armored Transport—a sort of intergalactic Trojan horse (by appearance…)—he rocks! Hello everyone! In today’s crossword puzzle, Ms. Donna S. Levin takes us to the bank to do some transactions, and the four theme answers that have to be deposited in the grid are all banking terms, but the terms act as puns for the accompanying clues. PRESENT VALUE (28A: [Tacky thing for a gift recipient to focus on?]) – I’m sure this behavior has happened one or twice from a gift recipient! MARKET RISK (58A: [Getting struck by a runaway shopping cart?]) – Coming from someone that has had a runaway shopping cart bang into my car in the parking lot, I know this can definitely be a legitimate risk! Wasn’t sure why I didn’t finish this faster than I did, as I didn’t have any real difficulty. Sometimes, you leisurely complete a grid only to realize you’re doing it a little too leisurely. Glad to see RICOTTA, not just because of the fill but because that reminds me to buy some and make some lasagna once again (23A: [Lasagna layer, frequently]). It’s been about two years since I made some homemade lasagna, as I’ve relied on my local pizza shop for my fix. Speaking of food, I’ve never had CHILI as a topping for any wiener that I’ve ever eaten (2D: [Dog blanket]). As a matter-of-fact, I only used to put ketchup on my hot dogs or eat them plain for the longest time. Only starting to get used to putting mustard on it…but it has to be spicy brown mustard. For LALA, I had the “-AL-” filled out, and, seeing its clue, I initially filled in Cali (33D: [Land of the ditzes]). Sorry, Californians! DRACHMAS is not only fun fill, but somewhat timely with what’s going on in Greece with the new regime in office and talks between Syriza and the Eurozone in how to take on their economic plight (38D: [Erstwhile Greek coinage]). “Sports will make you smarter” moment of the day: GUMP (34D: [OScar-winning Hanks role]) – One of the greatest goaltenders in NHL history, GUMP Worsley (given first name was Lorne) played 22 seasons in the professional ranks, winning four Stanley Cups with the Montreal Canadiens in the 1960s. He also played professionally for the New York Rangers and the Minnesota North Stars. 19a. [Comedian Garofalo gives negative feedback? ], JANEANE NAYSAYS. 24a. [Topeka residents provide instructions? ], KANSANS SHOW HOW. 44a. [Brew inspired by a fictional search engine on “The Good Wife”? ], CHUMHUM PALE ALE. Don’t watch the show, so the CHUMHUM bit was all crossings for me. 53a. [Grammy category for five-year-olds? ], BESTEST SINGING. Points for an unusual theme approach, though I didn’t find the theme particularly rewarding. The main challenge was sussing out what was going on in the theme. 2d. [“___ Horseman” (title character voiced by Will Arnett)], BOJACK. Did not know this at all. 4d. [Imaginary figure], PHANTASM. Pretty word, isn’t it? 41d. [Daytime fare with Sharon Osbourne], THE TALK. I tried THE CHEW first, which is mostly (or all?) male hosts. The Talk is the one with the snide Roseanne daughter, right? Facebook’s trending topics inform me that Sara Gilbert and her wife just welcomed a baby. 1d. [Modern pictograph], EMOJI. Really nice clue, that. And, of course, contemporary answer. I liked the intersecting Donald Duck nephews, HUEY and LOUIE. Less enamored of the clunky bits like ETH EEN UTE TERA SAIS YAH ALG. The puzzle’s AJAR (43a)! I mean, afoot! 1a/69a. [ … subject of this puzzle] DOCTOR WATSON. 7a. [Portrayer of of 1-/69-Across in “Sherlock Holmes” (2009)] JUDE LAW. 38a. [Portrayer of 1-/69-Across in the BBC’s “Sherlock”] MARTIN FREEMAN. 68a. [Portrayer of 1-/69-Across in CBS’ “Elementary”] LUCY LIU. 15d/48d. [ … 1-/69-Across creator Arthur] CONAN DOYLE. Handy that LUCY LIU and JUDE LAW are both seven letters in length; quite possibly that was the theme’s origin. At least, that’s my inference. I’m a bit torn on the implementation of the theme. On the one hand I get that the three actors are all recent filmic incarnations of the long-suffering partner/sidekick, but it seems almost criminal to omit the 5-5 NIGEL BRUCE, foil of Basil Rathbone and for all intents and purposes the ur-Watson of cinema. His name would have fit precisely where CONAN and DOYLE are in the grid, and although the author is never referred to by only his surname, it seems ever so slightly unbalanced to provide the [Sir] Arthur (Ignatius!) in the clue and the final two parts of his name in the grid, even though he of course is frequently referred to as ‘Conan Doyle’ as if it were his surname. What it comes down to is that I would have preferred another Watson to flesh things out further as opposed to tying it off with the author. But only slightly. 38a [Secure in a harbor] MOOR crossing 45a [Cry for seconds] MORE. 10d [Senior officials] ELDERS crossing 21a [Wise folk] SAGES. 40a [Mork’s sign-off] NANU-NANU; 50d [Mork’s people] ORKANS. 64a [Natives of Tibet’s capital] LHASANS. Hey, I’m listening to Banco de Gaia’s Last Train to Lhasa (1995) right now! Kind of dupe with 12d [Political writer Coulter] ANN with 17a [“The Diary of Anne Frank” police] GESTAPO. Immanently [<em>sic</em>, see comments below) avoidable. 60d [“Major Barbara” playwright] SHAW. Not ‘Bernard Shaw‘, I might point out (for no particularly good reason). Least favorite bit: 58d [Four, on some sundials] IIII, which is a bit of a STAIN (57a) on the grid. 26a [Northern California town that once had a palindromic bakery] YREKA. Still haven’t gotten tired of this one, though. 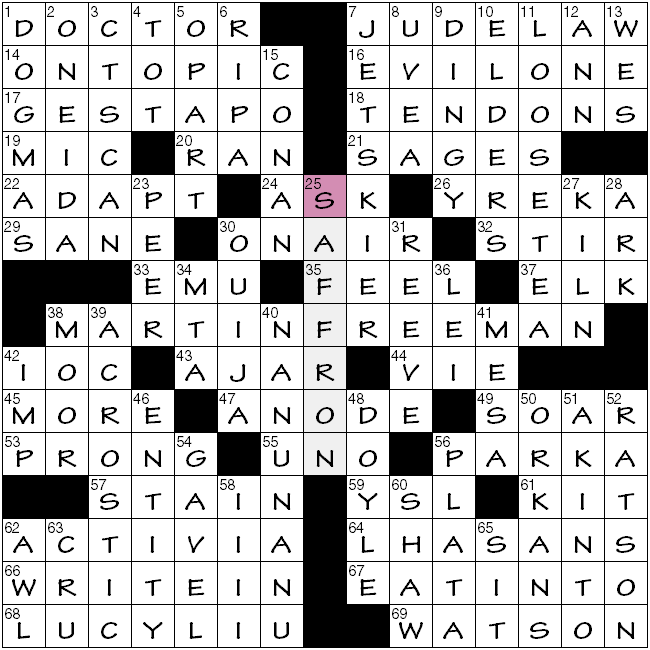 In the ultimate assessment, I find this not-so-mysterious crossword to be quite up to snuff. This entry was posted in Daily Puzzles and tagged Donna S. Levin, Elizabeth C. Gorski, Kristian House, Matt Jones, Mike Buckley. Bookmark the permalink. where the nyt is concerned, thank you, “final jeopardy,” for the thompson synchronicity. did kristian and will have an inside track on that? I’ve been looking for a Learned League in for half a decade now. Who do I have to convince I’m worthy to wrangle an invite? I’ll put together a trivia CV if need be. 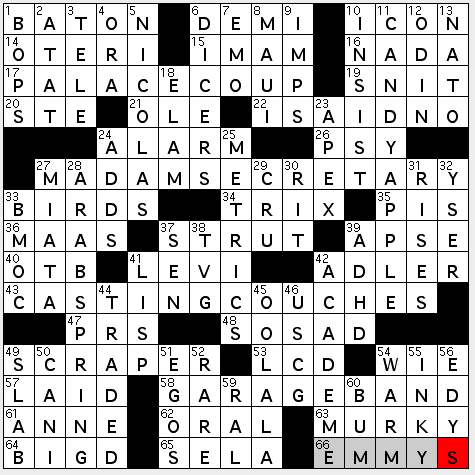 Side note: Today’s NYT is the first time I’ve beaten Amy ever. Typically, she crushes me by minutes. Huh – I always thought of Harry Truman as a pretty conservative sort! NAV for those of us in the financial industry (or at one time in my case) stands for Net Asset Value or what mutual funds are priced at each evening after the market closes. Got 7:49 on the LAT puzzle with no help, a new record! It feels like elementary, my dear Watson. Clever theme, but how come Liz went with STRUT/RIT and SELA/RAL instead of STRUM/RIM and SEGA/RAG? 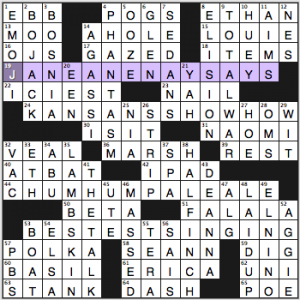 I found today’s LAT easy and fun, but I wonder if everyone will. I’ve seen all the recent Sherlock Holmes incarnations and was easily able to fill in the theme answers without a single crossing, but I’m guessing this won’t be true for everybody and wondered if this will affect their view of the puzzle. Easy, knew the names, but like Pannonica didn’t like the implication that Dr Watson had never been portrayed anywhere until 5 years ago. Was also set to remark on the omission of NIGEL/BRUCE but was pre-empted, as is the blogger’s droit. I too felt badly for NIGEL BRUCE, less so for Edward Hardwicke, but overall enjoyed the LAT. Pannonic; I do not understand “immanently” as used in this context? Perhaps your point was too subtle for me, but I did not understand and love to learn. Margaret, glad you found the puzzle “easy and fun.” That’s nearly always what I’m going for. But there is a point being missed here: the three actors included are portraying Dr. Watson concurrently; all three series are still in production. There is no slight intended to Nigel Bruce or Cedric Hardwicke, or to Dudley Moore, Robert Duvall, James Mason, Ben Kingsley, LeVar Burton, the list goes on. Yeah, pannonica, I thought you might mean “eminently”, but I was also wondering along with lemonade714 whether something deeper was meant. I have no good explanation for that lapse, except perhaps that there was something inherently misfunctioning in my brain. 7a. [Portrayer of of 1-/69-Across in “Sherlock Holmes” films (2009–present)] JUDE LAW. 38a. [Portrayer of 1-/69-Across in the BBC’s “Sherlock” (2010–present) MARTIN FREEMAN. 68a. [Portrayer of 1-/69-Across in CBS’ “Elementary” (2012–present)] LUCY LIU. Thanks for the explanation of Matt Jones but I still don’t understand what is going on. Not a rewarding experience in any event. Would have enjoyed it more if the theme answers had a meta connection. Would have been much tougher to construct though. Liked the Shady Grove video. What was the preferred version? I like this version better as well.